I finally decided to give in and buy a German made car. Perhaps it’s the clever marketing that captured me this time, but I want to believe it was the clever engineering that drew me to the 2016 MKVII Volkswagen Golf R. While some of the rivals in the segment (WRX STI, and discontinued Evolution) have used the same stale drivetrain for several generations, Volkswagen has taken a different route and the result is a modern drivetrain package consisting of a direct injected turbo four-cylinder as well as a refined double clutch transmission and torque vectoring AWD system. This most recent addition to the MotoIQ project car fleet is a real wolf in sheep's clothing, and in this article we will take a look at some of the cool features of this project car. The MKVII R interior is nearly identical to the interior of the GTI. The differences are minor choices of trim materials. We decided we didn't like the constant finger smudges on the piano black trim on the steering wheel and installed the chrome trim. Besides the sound engineering, I also found this car to be very refined in terms of the interior and ride quality. The leather is of amazing quality and feels better than what I’ve had in my Japanese cars. NVH issues are minimal especially compared to the 2015 WRX I previously used for daily driving duties. The doors shut with that solid thunk sound that is so uniquely German. Having been a die hard Japanese car owner, making the switch has left me with a few striking observations on the differences between the MKVII Golf R and the Japanese cars I’m used to driving. The primary difference from my initial impressions is that the Golf feels like a luxury car compared to the rental car feel of the WRX and Evolution interior compartments. The details on the trim give the Golf that little something extra that is sorely lacking in the Japanese cars. These observations are just my subjective experience with cars I’ve owned. On to the more interesting bits. This car has a lot of great engineering features that reflect what a modern turbocharged AWD sports car can be. We will start by taking a look at some of the notable features of the EA888 engine. The EA888 engine has several variations which include 1.8L and 2.0L displacements. 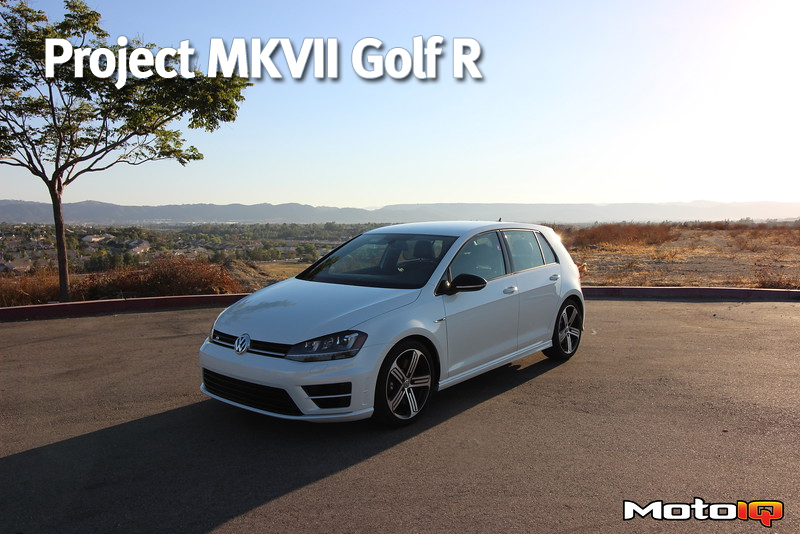 The MKVII Golf R EA888 was improved in a motorsport type development program with some performance oriented features including a different cylinder head material, different exhaust valves and camshafts, higher flowing injectors, strengthened connecting rods and pistons, and a larger turbo. All of these changes add up to a powerplant producing a very smooth 292 whp and 280 lb-ft of torque. 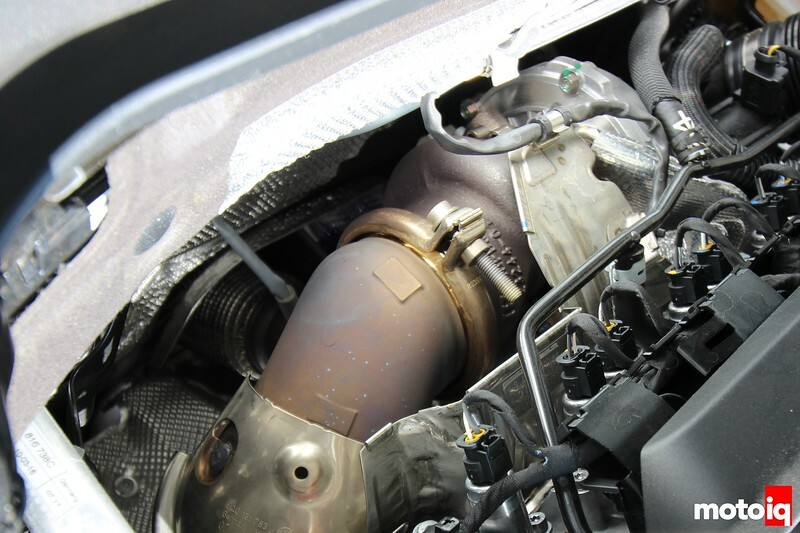 The IHI IS38 turbocharger on the MKVII R features a billet compressor wheel and electronically actuated wastegate. This turbo flows well and has a lot more power left in it. We will be tapping into this power in later project installments. 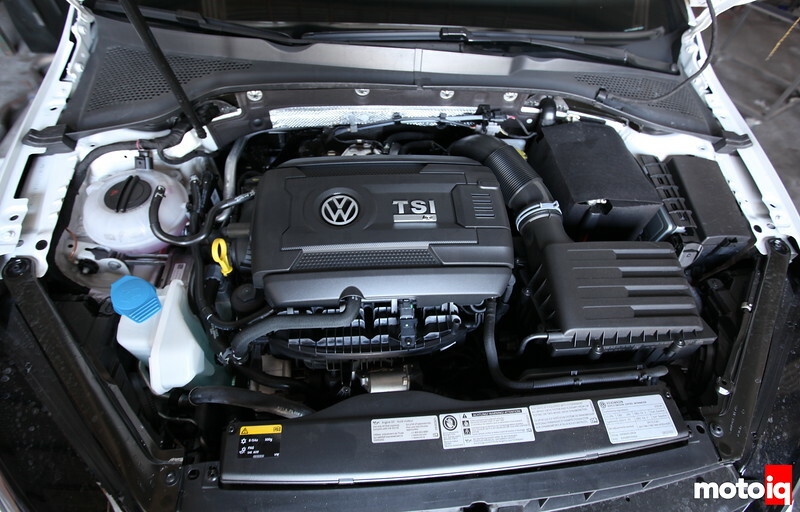 In addition to the Golf R specific changes, Volkswagen AG has gone to great lengths in this third generation of the EA888 engine in their efforts to improve efficiency and reduce emissions. This quest for improved efficiency has produced a properly modern engine. One of the stand out features of this engine is the cylinder head integrated exhaust manifold that has coolant passages around each exhaust runner. 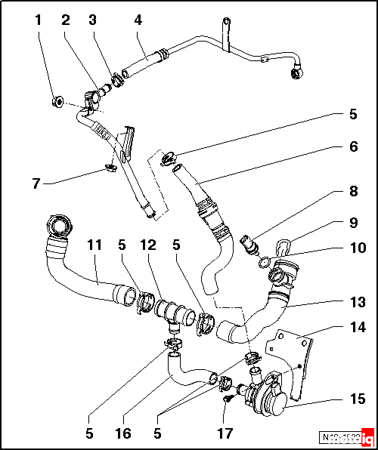 This allows for a reduction in EGT at the turbocharger inlet of up to 320* F.
Exhaust manifolds that are integrated into the cylinder head are not a new thing by any means with several manufacturers such as Honda already using this technique for their own cylinder heads. Where the integrated exhaust manifold really shines is in a turbocharged application. The ability to lower the exhaust temperature with cooling jackets surrounding the exhaust runners eliminates the need to enrich the fuel mixture at high engine loads to prevent knock. This is great news if you have a heavy foot. How much of a difference it will actually make in MPG when the vehicle is driven hard is yet to be determined, but it is still a noteworthy advancement in a turbocharged application. Volkswagen uses an auxiliary electric coolant pump to circulate coolant through the turbocharger after the engine has shut off. The pump runs periodically when after the engine is shut down to cycle fresh coolant through the turbocharger cooling passages. VW added some fancy cooling system features to the EA888 that help extend turbo life as well as reduce engine warm up times. Not satisfied with the effectiveness of simple thermal siphoning for turbo cooling after engine shut off, VW decided to install a small circulation pump to run coolant through the turbo after the engine has been shut off. You can hear the pump run periodically for a few seconds at a time after the engine has shut down. The periodic coolant circulation helps to extract some of the built up heat in the turbo housings that would otherwise find its way to more sensitive areas of the turbo rotating components and lead to early failure. VW uses an electronic thermostat that can isolate coolant flow to the cylinder head during engine warm up to get the engine up to operating temperatures quicker as well as warm up the interior cabin quickly. I have found that the passenger compartment heater starts producing heat in less than one minute which is very useful for those colder days.